The stage design for Eurovision 2017 has been revealed: A circular footprint, which exemplifies the theme for the contest this year: Celebrating Diversity. 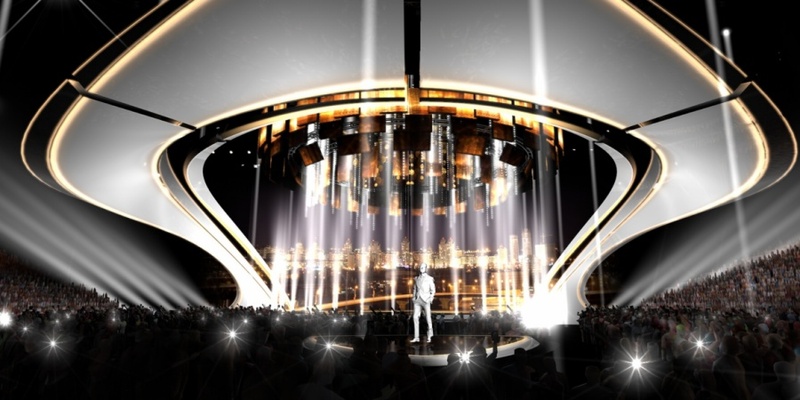 The design for the Eurovision 2017 stage symbolises Ukraine being the centre of Europe in May and allows fans to be as close to the performers as possible. The dynamic stage design, which incorporates multiple media surfaces, will create a unique setting for each act, allowing every performer to shine on the night. Florian Wieder is the Creative Producer and Production Designer, and has the task of designing the stage for this year's Eurovision Song Contest. It is not the first time he goes into stage design. In his portfolio is a wide range of scenes used for TV production: 16 MTV awards, "America's Got Talent", "Britain's Got Talent", Eurovision Song Contest in Vienna in 2015, Dusseldorf in 2011 and in Baku in 2012, as well as the Austrian versions of "Star Mania", "Dancing With the Stars", "Heroes of Tomorrow" and "The Big Chance". He has also designed scenes to Beyonce, Jennifer Lopez and U2! After each country has submitted their song for Eurovision 2017 to EBU, each country gives instructions to the host broadcaster on how to stage their entries, the so-called "look and feel", so the host broadcaster can begin the initial preparations of each song's stage layout. The technical team then has around 40 days to prepare lighting, LED content and camera angles for each song, based on ideas and request from each country. Eurovision Song Contest 2017 takes place in Kyiv, Ukraine, with 43 participating countries. The arena for Eurovision 2017 is Kyiv International Exhibition Centre.